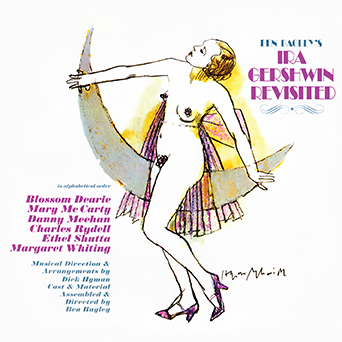 This thoroughly delightful album is loaded with sparkling performances by Blossom Dearie, Mary McCarty, Danny Meehan, Charles Rydell, Ethel Shutta, and Margaret Whiting. For the original CD release, Bagley added a few songs, and those are sung by Dody Goodman, Paula Lawrence, KT Sullivan, and Arthur Siegel. Honestly, who could ask for anything more? IRA GERSHWIN REVISITED is limited to 500 copies only and priced at $19.98, plus shipping. CDs will ship by the second week of July, but never fear, we’ve actually been averaging three to five weeks early in terms of shipping ahead of the official ship date. ATTENTION INDIEGOGO CONTRIBUTORS: IF YOU WISH TO RECEIVE THIS RELEASE YOU MUST OPT-IN BY SENDING US AN E-MAIL – SEND TO kritzerland@gmail.com. IF YOU DO NOT WISH TO RECEIVE IT, YOU DON”T NEED TO DO ANYTHING. IF YOU ARE NOT AN INDIEGOGO CONTRIBUTOR, ORDER AS YOU NORMALLY WOULD. THANK YOU.